I was a bit surprised this past week when a couple loudly told me they preferred using film and doubted they would ever bother with digital. They smiled knowingly while pronouncing digital as an in inferior way of doing photography, and that those that used digital cameras couldn’t make good pictures without a computer. Of course, I told them I disagreed, but I also had to say that they should use whatever makes them comfortable. I like black and white film and mentioned that also. I find that many photographers who use film cameras instead of digital constantly make sure others know their choice, and like to offer a rationale for using film with statements as they did, and saying, “This camera has always taken very good pictures why would I change”. I can’t argue with what seems to me a reasonable statement, however, in my opinion, the difference between digital and film is like driving a 1970’s car and the latest 2015 model car across Canada. As with film, I really liked those old fuel-guzzling, muscle cars, but the smooth, inexpensive performance, the stylish comfort and the myriad of options available for the operator of the 2015 model car will make the experience safer and more relaxing and than the 1970 version, just like using a digital camera does. This couple were so emphatic about how great the pictures were that their film cameras produced pictures that I naturally assumed they do their own darkroom work. But no, they take their film into a lab that processes it, then scans it to a computer, then with predetermined settings determined by a computer set up by some technician they get their prints. Hmmm…., not much photographer input there, and a lot more “digital technology” then I cared to mention. Oh well, at least they are taking pictures. Later I as I contemplated about when I used to shoot film I thought, there was something to be said about the permanence, and how it demanded we get it right the first time. There were no second chances, and if more than 36 exposures of some subject were needed there was that “dead in the water” moment while changing film unless I had a second camera hanging around my neck. Forethought was a required option; and with regard to multiple cameras I can remember packing a bag with one body loaded with black and white film, another with colour film, and a third with slide film. When referring to the time when we both earned a living as photographers using film, my friend Alex commented, “Oh, the days of click and pray.” As I wrote, there are no second chances. Especially for a photographer that relies on a lab for processing and printing that roll of film. I will say that shooting film certainly slows one down. Shooting a roll of film every now and then might be a good idea. One can easily pick up an old film camera and put a roll of film in it for less than a $100. Relying on a lab for colour processing might lift the cost much, but I have no doubt with a bit of searching we all could find someone with a home dark room to process a roll of black and white film. I don’t know if that is getting back to basics, as a photographer that I met called shooting film, nevertheless, it would be fun to use one of those heavy, old, shiny, metal cameras again. 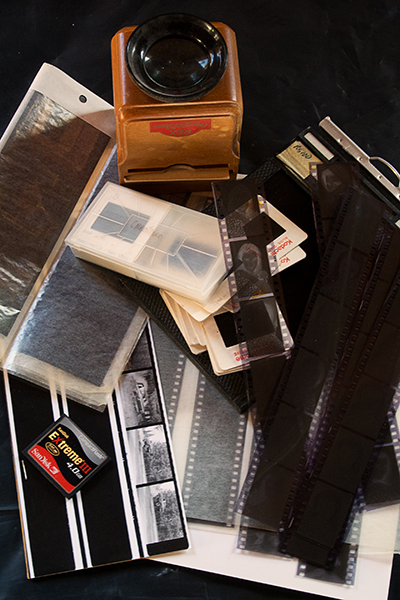 And who knows, using film might become a regular way to, hmmm….get back to the basics of a time gone by. This entry was posted in Photography and tagged back to the basics, digital cameras, DSLR, film, Film Cameras, John Enman, old film camera, Photographing, photography, pictures, roll of film, the days of click and pray, Using film. Bookmark the permalink. I used to use three bodies – one for slow slide film for landscapes, one for faster tungsten slide film to push for live music and one for IR colour slide film. I had five bodies altogether, some of which were very inexpensive second hand. My Nikkorex, for example cost me $40. The shutter worked – what else do you want in a camera? I drove a 1970 MG Midget for 16 years until 5 years ago. It seemed perfectly viable except for reliability though admittedly the Mazda MX5 I have now is much better. Perhaps film is more like horse and cart, and daguerrotypes maybe like carrying your own palanquin. I switched to digital about 7 years ago after more than 35 years of shooting film. Aside from the fact that I really miss the darkroom in which I processed and printed, I can say that, for me, conventional film photography has no benefits over digital except for the physical film, slide or negative, that can be preserved. I’m not convinced there is much permanence in digital when you think about the state of photography 100 years from now due to ever changing technologies. But unless there are some tremendous breakthroughs in medical technology, I won’t be around to worry about it. The film darkroom was a refuge. I guess I sort of, like you Oneowner, miss that. Regarding your comment on the lack of permanence of Digital, I really do agree. We can still find people with their family images from the mid 1800’s, but will there be anything left of from those 2015 family photo archives in 200 years? I wonder. Print print print….that also seems to be a dying art for the average photographer. People take thousands of photos that no one ever sees it seems, including the precious baby and family images. Hi Wendy. The new batch of modern photographers, or as you refer to them, “average photographers” seem to be more interested in the “Act of” and “Celebrity of” photography than making photographs. And just like the days of film, one has do invest money (and education) in the equipment to print those precious pictures. I talked about film and you thought about Prints fragg. I suppose that is a sign of the times. When we used film most people had packages and albums of pictures. Now we keep ’em on the computer waiting for it to crash and loose the memories. I too like the immediacy of digital. I loved the smell of developer in the morning..
Ahh…you must still have a room filled with chemicals Han. I have some film developer and fix that I use when my wife decides shoot a roll with her twin lens. However, I don’t print – I scan. I print my family photographs and have a gallery going up my stairway, I add to it every year and can see the changes in our grandchildren as I walk upstairs. But apart from my polaroids I don’t think film is quick enough for me, I’m old and life is too short!